Camden is built over a waterfall! It’s astonishing, really. Camden was built on top of a rushing waterfall! The town fathers chose a most unusual spot to place their mercantile buildings more than 100 years ago – and they are still there! 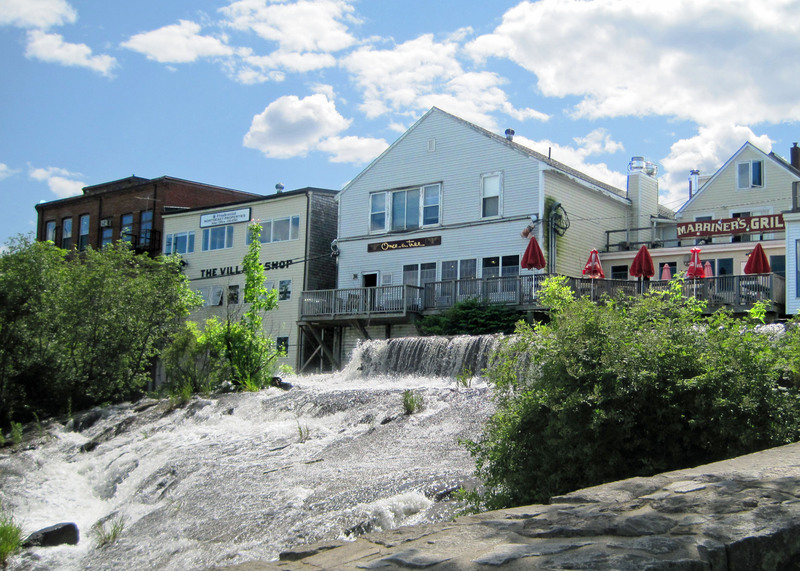 A row of shops and restaurants stands above the gushing Megunticook River at the point where it empties into Camden’s busy harbor. While admiring the scene I was reminded of a memory from many years ago. The first true vacation I ever took included a couple of days in Camden and a visit to Camden Hills State Park. A young couple from the flat lands of central Ohio, we were enchanted as we followed a rushing stream downward, over a rocky path, through autumn woods, to the point where the water fell over the cliff and onto the rocks below. Camden seemed little changed when I returned nearly 40 years later. The white steepled churches, the lovely town library, the active Main Street, even the Maine Stay Inn where we spent a night on that long ago trip, are still there, are still the same. White houses line Route 1 as it makes its way out of town, big houses from 100+ years ago, lovingly preserved, proudly standing tall. Beautiful two-masted schooners idle in the harbor, available for visitors’ day trips. Camden is a place where I could happily live – at least in the warm weather months! Friday afternoon walking tours, late June to mid-September. The tours are free, begin at 4:00 p.m., last for one hour and begin and end at the Children’s Garden of the Camden Public Library on Atlantic Avenue. Here’s a link to one of the companies offering day trips on old sail boats:. There’s a blog at that site as well that provides more information about goings-on around the harbor. Visit Owl’s Head Lighthouse. This site will tell you all about it! Camden celebrates the 4th of July for three days each summer. Beginning July 3 enjoy live music in Harbor Park, family events, parades, and fireworks on the 4thFor more information, contact the Penobscot Bay Regional Chamber of Commerce, 207-236-4404. Camden’s official summer season ends with the annual Labor Day Windjammer Festival, a festival of the town’s maritime heritage. Schooners sail in from other Maine ports on Friday and the fun begins. After dark, fireworks officially kick off the weekend, and festivities continue for three days. Click here for more information. The Camden International Film Festival (September 25–28, 2014) showcases international documentary cinema. The Festival highlights work that shows dedication to craft and a unique and artistic approach to telling a darn good story. The Festival utilizes beautiful and unusual venues in Camden, Rockport and Rockland, Maine. Screenings are followed by intimate Q&A sessions with directors and industry professionals. Activities include panels, workshops, photographic exhibits, musical concerts and exclusive parties. Click here for more information. Among the small coastal towns of Maine, Rockland stands apart as the “business town” for the region. Although its year-round population is a tiny 7600, its core is a small city. Today its 19th century mercantile buildings contain unique shops and restaurants. Rockland’s centerpiece is the Farnsworth Museum, an art museum housed in a number of traditional old buildings. A former Methodist church has become a principle gallery, home to the work of three generations of the Wyeth family. It is concentrated on art created by N.C . Wyeth, his son Andrew, and Andrew’s son James Wyeth. Andrew Wyeth is particularly known for his connection to the coast of Maine. A special exhibition “The Wyeths, Maine and the Sea” is on display through December 31, 2014. During my visit I enjoyed finding the 12-foot-tall “Love Wall” by Robert Indiana, one of many expressions the artist has created based on his famous squared “LOVE” graphic. For the traveler there’s much to explore in Rockland and nearby towns. The Maine Lighthouse Museum is one of several destinations in the area for those interested in history. The others are the Owls Head Transportation Museum, the Historical Society of Rockland County, the Penobscot Marine Museum, and the General Henry Knox Museum. Ride a ferry 12 miles out to sea to Vinalhaven or North Vinal islands, enjoying the spectacular coast views en route. Within 25 miles of Rockland there are three state parks with gentle walks and more challenging hikes. The shops and galleries of Rockland provide opportunities to find unique souvenirs, reminders of lovely summer days along the central coast of the great state of Maine. In July Rockland hosts one of the most respected Blues Festivals in America: www.northatlanticbluesfestival.com. 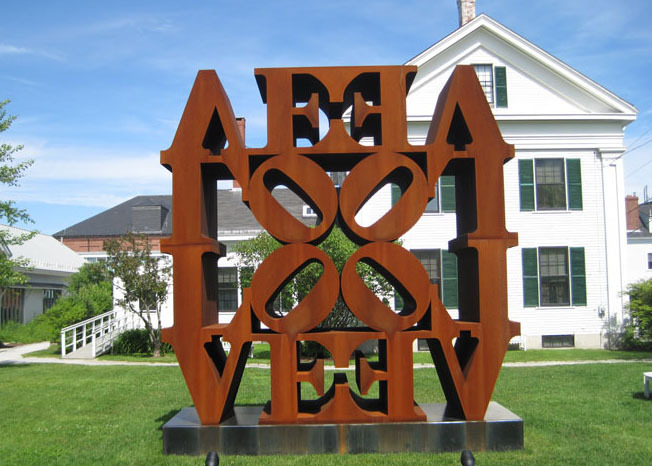 The sculpture (shown above) taken on the grounds of the Farnsworth Museum is Robert Indiana’s LoveWall, created about 1967. May, 2018 addendum: Robert Indiana died in Vinal Haven, Maine on May 19, 2018. You can read about his life here. The coast of Maine at Camden. Penobscot Bay. Those words conjure images (or memories) of sweet summer days in Maine. Giant fir trees on rocky shores. Cool mornings, sunny days spent exploring the coastline by kayak, bike or car. Charming small towns, some made for tourists, some simply home to authentic Mainers whose families have lived here for centuries. Off shore islands, lobster pounds, classic old houses — summer living at its best. Small towns and villages scattered up the coast. Come with me now on a ride up Route 1 to discover some of my favorite places and some special events to be found only on the Coast of Maine. Kennebunkport Famous as the vacation home of President George Bush the first, Kennebunkport has drawn summer visitors for many years. A week-long vacation there once caused us to move to New England shortly afterward. It was a move we never regretted. Consider visiting Kennebunkport in December for its “Christmas Prelude” festivities. It’s an event so special that caused HGTV to name Kennebunkport one of the Top Ten Christmas Towns in America. Portland The waterfront area of Portland is filled with note-worthy restaurants and unique shops making it a fun place to spend a day or longer. Located a short distance off-shore one of my favorite places, Peaks Island, is an easy ferry ride away. Here you’ll feel like you’ve turned the clock back about 50 years (or more). Brunswick is less than an hour north of Portland (adjacent to Freeport and you know what that means!). An historic town filled with large 19th century homes, Brunswick is the site of Bowdoin College. It was once home to Gen. Joshua Lawrence Chamberlain, Union Army hero of the Battle of Gettysburg who became president of Bowdoin College. His home is now an interesting museum. Brunswick hosts the annual Saltwater Celtic Music Festival which will be held October 3-5, 2014. You’ll find lobster everywhere in Maine, but for a true Downeast experience, take time for a drive out to Bailey’s Island and Cook’s Lobster House. Wiscasset As you continue north on Route 1 you’ll pass through the waterside village of Wiscasset which calls itself the “prettiest village in Maine” – a claim that’s probably true. Stop to meander, poke your head into antique shops, and grab a bite to eat at Red’s Eats – listed by “Road Food” for its 5-star lobster roll. Boothbay Harbor Always my favorite waterfront town, Boothbay Harbor stands out in a lineup of charming places. Click the link above to find a photo collection that may explain why. For two fun-filled days each June windjammers sail into Boothbay Harbor for the annual Windjammer Days Festival that’s been a tradition here for nearly 50 years. Continuing up the coast you’ll come to Rockland and Camden which will be the subjects of my next two posts. Rockport, located between Rockland and Camden, has long attracted artists and boaters and those who simply want to enjoy life quietly. Follow the road down the peninsula on the northeast corner of Rockport to Hog Cove, Salt Ledge and Beauchamp Point at the end of a very beautiful fir-tree-lined road. Pure Maine! Above Camden the towns are a bit farther apart. From Lincolnville you can take a ferry to Isleboro and Seal Harbor. After Northport and Kelly’s Cove you’ll come to the city of Belfast. The largest city along the Coast above Portland, the annual Harbor Fest and National Boat Building Contest provides much fun to visitors each August. Searsport is an old sea captain’s town possessed of two things I really like: the Penobscot Marine Museum (with of long lists of interesting activities) and one of the most delightful bookstores anywhere, Left Bank Books. Searsport is also a good place for antique shopping, although you’ll find antiques for sale all along the coast of Maine. Continuing north, make a right turn after Bucksport for Castine, another bit of history you can experience today. These little towns will remind you of a time when life was slower and perhaps make you just a bit envious of the people who live here year round. Mount Dessert Island is home to two famous places: Bar Harbor and Acadia National Park. 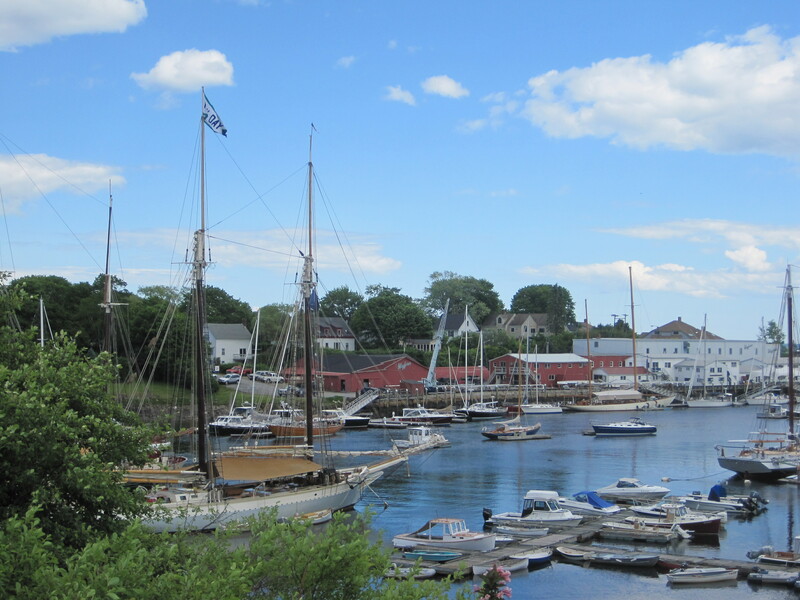 While you are certain to enjoy both of these, take time to discover Northeast Harbor, Southwest Harbor and Bass Harbor. Catch a ferry out to the Cranberry Islands just off shore. Find more information here.http://www.cranberryisles.com/ferries.html. If you continue driving north you’ll find yourself at the border with New Brunswick. The top of Maine isn’t on the Atlantic coast but it continues to delight travelers with its forests and small towns to explore. The State of Maine’s tourist brochure provides 185 pages of tips, events, descriptions and ads. It’s available for downloading here. If you prefer they will mail you one on paper. A long list of events held throughout the state can be found here. Tourism is very important to Maine – you will find a warm welcome wherever you go. P.S. Arthur Frommer is in love with the coast of Maine. This week his blog is about his vacation there. Read it here.